This review article discusses Bruce R. Smiths edition of The Cambridge Guide to the Worlds of Shakespeare, focusing on Shakespeares World, 1500-1660 in vol. I, and in vol. II on the global reception of his works in the centuries following (entitled The Worlds Shakespeare, 1660-Present). This Guide comprises 28 fields of knowledge subdivided into 277 chapters covering a range of topics, from approaches to Shake speares life over the multiple strands of criticism through to adaptations and performances of his works across the media, and from book to blog. 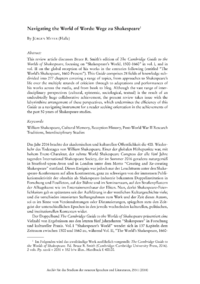 Although the vast range of inter - disciplinary perspectives (cultural, epistemic, sociological, textual) is the result of an undoubtedly huge collaborative achievement, the present review takes issue with the labyrinthine arrangement of these perspectives, which undermines the efficiency of this Guide as a navigating instrument for a reader seeking orientation in the achievements of the past 50 years of Shake speare studies.